When you notice any kind of electrical problem, call A-HOME for help. We do troubleshooting to accurately identify the issue; and if we find a problem, we make the necessary repairs, installations, or replacement. Our goal is to optimize your home's electrical system. We perform basic and advanced chandelier and ceiling fan removal, replacement, cleaning, and general maintenance. 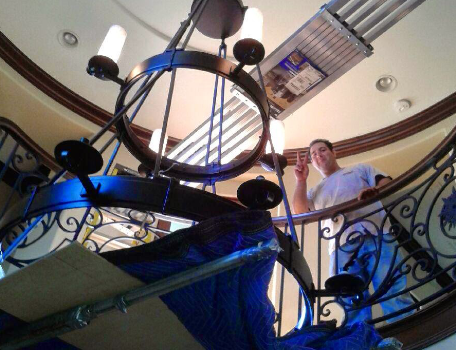 To make your chandeliers shine brightly again, we also perform the necessary electrical maintenance in Huntington Beach, as well as repairs. Over time, your home's electrical outlets and switches can become faulty. We replace outlets and switches to make sure power is there when you need it. Additionally, we protect you and your family from shocks by replacing ground fault interrupters (GFI). There's no reason to go to an electric car charging station when you can recharge your power at home. We have experience with Tesla and other EV charging equipment, and we can do panel upgrades to accommodate electric vehicle chargers for any make and model. We are also experts in panel upgrades and connections for solar PV panels.